While working on my Linkblog's Sherlock Channel, I realized that I would be extremely easy to hack together a RSS viewer in Sherlock. So I did. 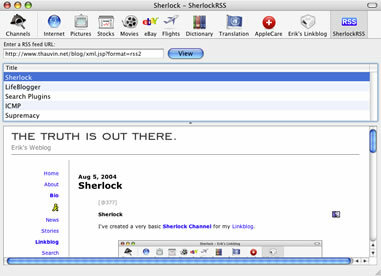 Why wait for Safari RSS when Sherlock can do it today? No installation required. Sherlock will do all the work. How's that for simple? The source is open. Someone (with a lot of time to spare) could easily implement all kind of custom functionality. I find it quite interesting that Apple would choose to only implement RSS support in Safari. Seems to me that the Sherlock channel subscription model is a perfect fit for content syndication. Why not simply let people subscribe to feeds via Safari, and use Sherlock as a viewer/manager? Then again, Sherlock is probably one of the most interesting, yet under-utilized technology, Apple ever came up with. This article was published on August 6, 2004.